Mortals believe they have mastered the Art of War, but it is we who invented it. Through the ages immortals have trained in the use of every weapon, from fang and sharp claw to the deadly toys which slay from afar. Our secrets are those of true warriors. Now these secrets shall be yours. * Expanded rules and new options for resolving combat in IMMORTAL role-playing games. * Details of the Shian-Rhi, the first martial art developed by immortals, as well as over 25 other fighting styles from around the world. 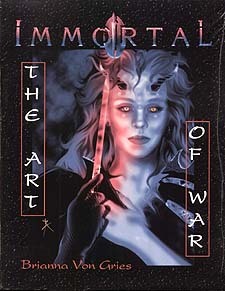 * 96 pages brimming with new combat maneuvers and weapons useable by all immortal characters.